My youngest favorite color is purple. While I'm not to fond of the color myself I've been searching for some ideas to add a pop of purple to her room without it being too whelming. Here is what I found so far. I had to laugh when I saw your post. I said the same thing... purple... NEVER. My post for this weeks show and tell friday, my PURPLE master bedroom. It's kind of grown on me though... thankfully! If I do "Purple", it would be in the accessories. Yes. That is what I am leaning towards. Ha ha, I shouldn't comment -- I have a purple kitchen! OMG. I've seen a lot of purple rooms before but never a kitchen. Purple accessories always add a great pop of colour! Give it a go, you might find you like it! I love purple though I have never painted a room that color (though I do have a very, very light lavender office). I thought that was funny that you associate it with Barney. I guess I haven't seen hardly any Barney so that isn't an issue with me. :-) Anyway- have fun with your purple room. The picture that you used for the link is what caught my eye. I love that room! I think you could use purple a little more than you think. The purple chairs are toned down with the addition of the black and white. I would maybe paint one main piece like the bed or something and leave it at that. They look lovely -- go for purple! What great inspiration photos! That turquoise wall with the purple ceiling is really fun! I never would have put them together. Thanks for sharing this! Pink and Purple - little girls' colors. I remember, my sister and I went after our dad's life to get a wall in our room to be painted purple. Not just any purple, DARK purple. Mom and Dad were not very sure about it but we did not bulge. My Dad cannot say 'no' his girls and finally we had the much coveted purple wall in our room, while the other three were painted pale pink. I did purple in my basement..Not the whole thing, but half and a year later I"m still trying to decide if I like it or not. I'm not to fond of taking pictures down here, because with the flash it screams PURPLE!!!!! 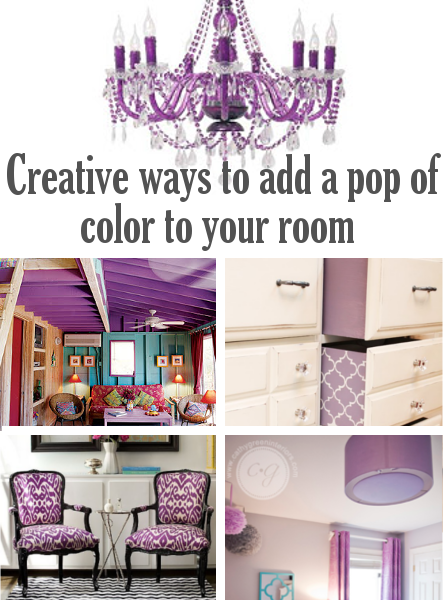 If you are going to use purple on the walls might I suggest a lighter shade (more lavender) or just an accent wall. Those accessories are much easier to trade out than walls or carpeting. That said, a few decades ago my friend had a truly grape colored wall, and she was the envy of all the other girls in the neighborhood. Of course we did not have to live in that room. Love the chairs at the end for sure! What if you went with a black/white/grey room with purple accents? Damask fabrics and stripes for some interest? I think it would look awesome! You post title made me smile. and I hate purple too! I can do lavendar and even eggplant, but never purple. I do love purple flowers.... but its weird that most colors don't effect me the way this one does! 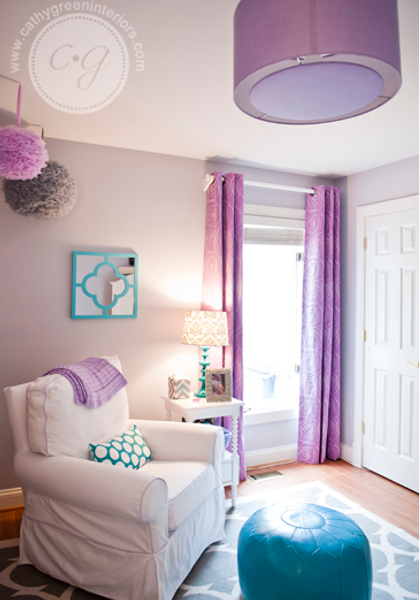 If my teenage daughter begged me for a purple room, it would have to translate into accents. I don't think I could apply the color on a wall! WHY is that?!! Sounds like I am not alone in this feeling though! The purple ikat chairs are gorgeous!! 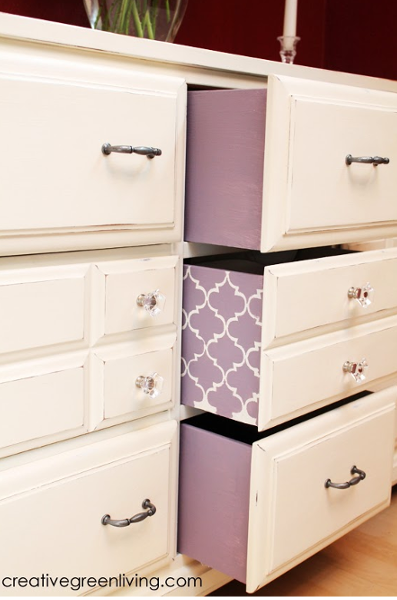 Skip the paint and go with decor! Easier to change later when you decide on a different color scheme. I'm not a fan of purple IN MY HOUSE, but I love the color purple. BUT, after seeing the pics, I might be able to live with it! Hope you post pics when you're done. Visiting from the Girl Creative and I LOVED some of your purple! I pinned a couple things! I love purple, but to much is annoying even for me. I'd stick with more of a plum or eggplant. I hear those colors will be the it colors this fall! Those are all fabulous purple choices! Every one of them. 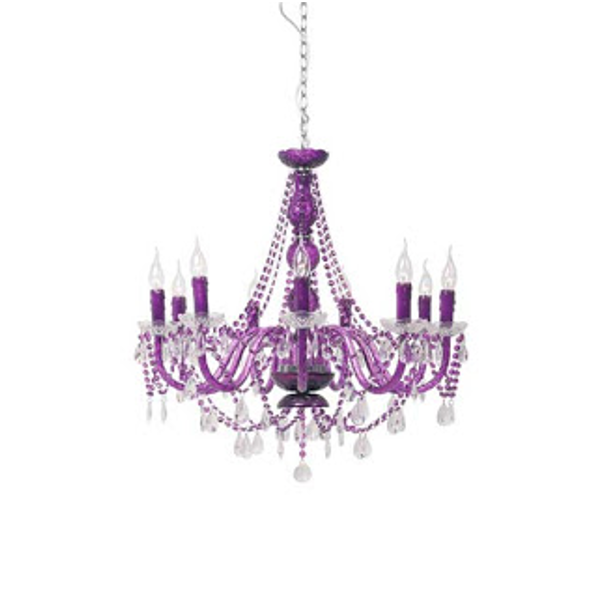 Love that chandy! I started to hate purple when my younger sister redecorated our bedroom in "Hawaiian Orchid" while I was away at college one semester. I didn't know about it until I came home on break. It was quite a shock! At that moment I realized I didn't live there any more. I sort of chuckled under my breath when I saw your post. may dad is 83 and I went over Thursday to the Dr. and stopped to visit him a while. He had been keeping busy he said. ( Just lost mom a year ago and dad is having a hard time) Any ways he just painted his large wall in the entrance way a very light shade of purple. Not only there he took it into the guest bathroom. And I have to say it really looks great. I had a purple bedroom when first married to my husband and only because after his divore from his former wife his mom came in and painted it when he was at work. LOL But now no way for a bedroom but have to admit my laundry room is purple. Not dark but I do like it. Well, since I live in a lavender house and most of the rooms - yes, even the kitchen are painted shades of purple and lavender.... I'll say HMPFFFFFF to your hatred of the color of royalty - lolol ! Take a peek over to Lavender Hill - you might see some purples you like ! Great inspirations! If you do go for painting the walls purple, you can always repaint it if it doesn't work :) Best bet would be the accessories. Thanks so much for linking up at Beach Cottage Good Life Wednesdays. Life cannot have enough purple, I am addicted to purple! Pretty! i admit I'm not as fond of the purple ceilings......but I like the rest!